Tin Can Bay Coast Guard QF17 thanked corporate sponsors Mt. Pleasant Social Club, David Brown and family – TCB Marina, Kev and Cath Reibel, Peter Lee – Lee Fishing Company, Terry Steele – Cooloola Coast Disaster Management Committee, Jess Milne – Youth Action Program and Chamber of Commerce, Zoe – TCB Couriers with a familiarisation boat trip on the Bay and morning tea. 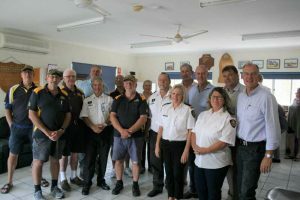 Mayor Mick Curran and Government Representatives Tony and Michele Perrett, Lachlan Millar, Stephen Bennett, and Pat Weir also attended, and gained an insight into our operations and offered advice for future directions. The hazardous weather has been challenging. We have had reports of vessels running aground, being swamped, dragging anchors to name a few. In these situations, if the vessel does not have Coast Guard Marine Assist and the owner given us a permission-to-board notice, there is little we can do but report it to Maritime Safety Qld. Owners should take responsibility for ensuring their vessels are moored safely and correctly. Our current raffle of two nights charter aboard a Tin Can Bay Houseboat is to be drawn on December 15, so please look out for tickets sellers. To keep our “boats afloat” we need community support and are grateful for the generosity of our supporters. If you would like to become a member of a worthwhile organisation in the community and can spare a few hours, please contact QF17. No experience is necessary. It’s a great way to make new friends and keep active. We currently offer community courses of First Aid, CPR, Basic Boat Safety, Navigation, Bar Crossing and White Water and Marine Radio Certification in November. Our next First Aid/CPR Course will be held on Saturday November 10. Members of the public who are interested should contact QF17 on 5486 4290 for details. We do perform a Scattering of Ashes service for the bereaved who wish to have the ashes of their loved one cast out to sea. We also have a Memorial Garden where a plaque can be placed.